Four outstanding young apprentices from the UK’s private security industry were presented with national awards in recognition of their academic and practical success in the field of electronic security installations. Awarded by the British Security Industry Association (BSIA), the trade body representing the UK’s private security sector, the Apprentice Installer Awards serve to recognise the achievements of Level Two and Level Three apprentices involved in the installation of alarms, CCTV, access control or a combination of these systems, and represent the commitment of security companies and training bodies in providing young talent with the opportunity to succeed in the security industry. Tom Parker of VSG received a national award for turning his fascination for technology into a blossoming career, already having worked on large-scale installations for high-profile clients including Macquarie Bank, London South Bank University and Lloyds of London. Selected to work alongside one of VSG’s leading technical engineers, 19-year-old Tom has already achieved the minimum level required to pass his college course and is currently undertaking additional modules while spending his spare time practising his work on a range of products. Nathan Sefton of Chubb Fire & Security won his award for demonstrating a sound knowledge and understanding of the industry, and for his methodical, level-headed approach to problem-solving. Already a point of contact for other engineers, Nathan excelled on a large project, where his documentation for over 30 sites was error-free and met strict deadlines. Nathan, 21, was selected to travel to Denmark in 2013 as part of Skills for Security’s Leonardo project. Aaron Noble of Kings Security was selected for a national award following his nomination by Kings Security’s Managing Director, Anthony King. With an ambition to become lead engineer by his mid-30s, Aaron, 21, has demonstrated an excellent understanding of theory and practical work. He already has experience of running complex jobs on-site and continually out-performs other apprentices of his age. James Kelly, Chief Executive of the BSIA, comments: “We are all well aware that in today’s challenging job market many young people may feel that a long term career is out of their reach. As such, the BSIA and its members fully support the development of apprenticeships which offer positions to young people who wish to gain practical skills and knowledge in the security industry, allowing them to ultimately develop long-term careers in the sector. This year, the Apprentice Installer Awards are once again sponsored by Pyronix, whose Chair and Chief Executive, Julie A Kenny CBE DL, comments: “As the cost of University education has increased dramatically in the last few years, there has never been a better time for the security industry to appeal to the younger generation who want to work, develop a career and earn money. All four winners were presented with their awards by Guest of Honour, The Rt. Hon. Baroness Smith of Basildon, Shadow Home Affairs Minister for private security, at the Association’s Annual Luncheon on July 16th, hosted at the London Hilton on Park Lane. 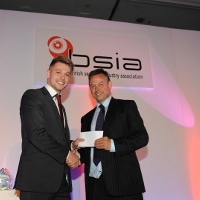 The BSIA would like to take this opportunity to thank Pyronix Ltd for their kind sponsorship of these awards.